Osmania University successfully conducted OU Common Entrance Test 4th June to 13th June 2018. A large number of candidates who are studying the same appeared for the exam. Candidates who had written the exam are eagerly waiting for the results. Now, the wait is over. Osmania University declared OUCET results. Candidates who had written the exam can check the results from the official website or from the direct link provided below. Osmania University is a public university, located in Hyderabad, Telangana, India and was established in the year 1918. This university consists of the constituent and affiliated colleges. It is one of the premier educational institutions of the country. It was established and named after the seventh and last Nizam of Hyderabad, Nawab Mir Osman Ali Khan It is the third oldest university. The OU is one of the largest university systems in the Indian subcontinent with over 300,000 students on its campuses and affiliated colleges. It is particularly known for its faculty of Engineering and Technology, Law, Arts, Sciences, Commerce and Management departments. Osmania Medical College was once a part of the university. The university colleges are located within the main campus of the university. There are eight such colleges Students who had appeared for the exam can check the results from the official website. Osmania University exam Results 2018. Osmania University Common Entrance Test to offer admission into various PG, and Integrated courses in Osmania and Affiliated Universities. The OU conducts UG, PG Examinations in the semester. 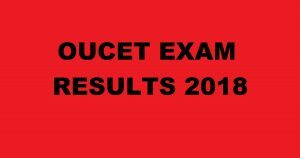 Candidates who had appeared for the exams can check the results from the direct link provided below. Candidates who did not satisfy with the results can apply for revaluation through online. The revaluation date is not yet released. For further details about results, candidates are advised to go through the official website of the University. Click on the link “OUCET Results 2018”. Enter all the required details like registration number and others in the provided fields. The OUCET scorecard, the rank will appear on the screen.